the monument. There was an old church near the beach where his body laid for 24 hrs, and a memorial. (See pictures) To think that this man walked thousands of miles in Africa, preaching the good news of the gospel -back in the 1800's- is both humbling and inspiring. 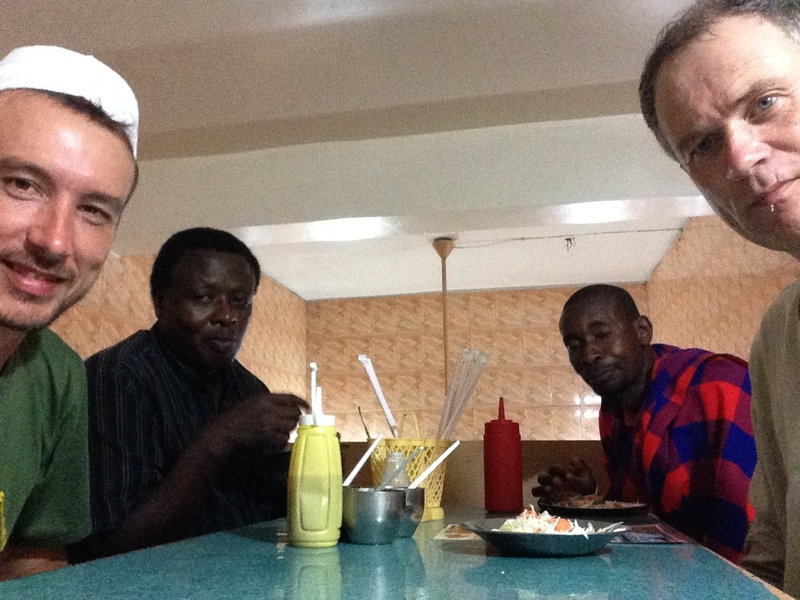 Back in Dar Salaam, where we plan to start the ministry, we were met by a Finish pastor who traveled 24 hours by bus from Kenya. Pastor Jukka was accompanied by 2 of his students, James and John (-but no Peter!). John is actually Tanzanian, and James is a Kenyan.. he wore his traditional blanket the entire time! We had wonderful times of evangelism and visitation of contacts (some of ex-Muslim background). Particularly encouraging was one older gentleman that we've befriended. He is keen to assist us in helping register the church. Please pray for this process.. The Kilimanjaro Ferry service is a high speed luxury boat that takes just 2 hours to reach Zanzibar. The island is always a highlight of my trip. Zanzibar is still part of Tanzania, giving certain liberties that are not common for majority Muslim places. Still, we use wisdom and discretion whenever we visit. We don't use printed tracts, just our mouths! We had 2 times of evangelism, and 2 Muslims accepted Christ! I continue to see Dar Salaam as the best place to reach Zanzibar Island from. On the 2nd day, as we were waiting for our ferry, we went swimming in the crystal blue ocean. On the beach, a young muslim (in his 20's) began initiating a conversation asking questions about the Bible and the Gospel. “I am a Muslim,” he said, “What do you believe..?” After sharing with him he seemed to hesitate, saying he was not ready. But I encouraged him that, despite everyone else on the island believing something else, it doesn't make it true. He agreed, and allowed me to pray for him, on the beach, that God would show him the truth. I am encouraged by their openness and left thinking how much God loves muslims, and how Satan hates muslims. They really need the gospel. The flight to Zambia is 2 hours. After spending 5 years in Lusaka, I felt like I had arrived “home.” Back at the Manda Hill Lodge we met up with Pastor Scibelli as well as Pastor Renaldo (who is now in Zimbabwe -south) and Pastor Chris (who is in Malawi -east). The churches are doing well. It is encouraging to see leaders we helped to train, continuing in the Word and Grace. There were many people I have never met before, and it reminds me that missions is about laying a foundation (1Co3.10). The bus trip to Kitwe took 7 hours, with 30 leaders.. and plenty of singing! Arriving back in Kitwe, we were welcomed warmly by the church. The ladies all wanted to see Melinda! The property was immaculate. People had donated time and substance to host the guests who traveled there. The chapel was at roof/ lintel level (roof sheets are purchased, but they desperately need wood for a frame, as the rains have started). For our trip there were temporary coverings for guests, temporary showers and plenty of food! I was overwhelmed to see how Benson and the body have been motivated and was pleasantly surprised to find that things seemed in better shape than when I left! One conversation I had with one of the new students left me very encouraged. I had never met him before, he had moved from Ndola, another town an hour away. He has clearly been receiving good instruction from Benson this semester. As we discussed the Word I could sense that he is benefitting tremendously. 2Tim2.2 came to my mind. I was also able to bring with me a gift from a kind friend, for the Kitwe Grace Hour radio program. After some complications with the local radio station (trying to triple their price), we concluded God wanted us somewhere else. Now.. we are on radio nationwide! Last Stop: Pretoria, SOUTH AFRICA! Deciding to turn south again, I journeyed to Pretoria, South Africa. I met up with Pastor Scibelli and the team. I was driven to the airport by a Bible college graduate from Kitwe, and picked up by Pastor Jakko in Johannesburg. He drove me directly to the “big tent revival” meeting in “Nelmophias” township in Pretoria. We got there just in time to hear Pastor Scibelli's message conclude. I was so edified by the warm reception of my fellow South Africans in Christ. They have an amazing church and team of leaders, led by Pastor Jabulani, with a mission to the country of Mozambique, a few hours away. Sitting in one of the meetings, listening to Pastor Scibelli preach, I had a flash back to 15 years ago, the first time God connected us in Durban, South Africa, and how my life has been forever changed. I also got to meet up with my long lost cousin, who drove all the way to Pretoria to meet with me. He confided in me that, feeling a bit alone, without family, he had just prayed for God to send someone..